Any book about London is OK by me, so I was thrilled to find this little gem of a book on my most recent visit last November (although the shop where I found it, The Book Warehouse, is sadly apparently closing soon -- if it hasn't already). 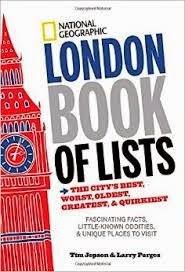 The London Book of Lists includes (according to the subtitle) "fascinating facts, little-known oddities, & unique places to visit." It's always nice to find a book about London that presents facts in an interesting way, and this book certainly fits the bill! The book isn't really divided into categories -- one interesting page of facts simply follows the next, although there is a "Fast Fact" of fascinating information on nearly every page. My favorite of these is the fact that the Duke of Westminster offered to sell the US the land that the American Embassy is located on, if the US would return the land his family lost in the Revolutionary War. The US didn't take him up on the offer, since this mainly encompassed the state of Tennessee. It might have made for an interesting geographic feature if it had worked out! Some of my favorite lists include "Who's Buried Where," an overview of the major cemeteries and the famous inhabitants to be found within; "Infamous Murders and their Locations," proving Jack the Ripper doesn't have a monopoly on gruesome murder sites; and "The 15 Oldest Stores" still operating in London (the oldest dates from 1676). The book is packed full of fascinating facts and information, but there are also plenty of lists that are subjective, such as "London's Best Markets" or "The Best Fish and Chip Shops." Still, it gives you a background on the places mentioned, as well as addresses to look them up on your next visit. I also enjoyed the "first person accounts" included of such things as the plague and Victorian-era slums. It's one thing to read a modern perspective of terrible places and events, and quite another to re-live them through the eyes of those who were there. Plenty of statistics are also to be found, including those involving the Underground, The River Thames, and Westminster Abbey. Along with the numerous photos (all in black and white), this book is a handy and fascinating look at all aspects of London. The disclaimer by the authors at the front of the book states that they have done their best to compile the facts in the book -- even when older claims are hard to verify or sources disagree. They invite comments on their Facebook and Twitter accounts, so we can hope this means that if there is enough interest there might be an updated and expanded second edition sometime it the near future!